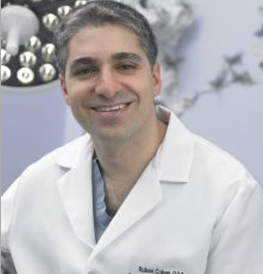 Dr. Cohen is our Board Certified Oral & Maxillofacial Surgeon. Born in France, Dr. Cohen grew up in Paris and Los Angeles. He attended Brandeis University, where he obtained his Bachelor of Arts. He then obtained his Doctor of Dental Surgery degree at New York University College of Dentistry, and completed a Post-Graduate Internship and Research Fellowship at Louisiana State University Health Sciences Center, in New Orleans, LA. He subsequently finished his oral & maxillofacial surgery training at Allegheny General Hospital, in Pittsburgh, PA, where he was Chief Resident for one year. He is a Diplomate of the American Board of Oral and Maxillofacial Surgery, and a Diplomate of the National Dental Board of Anesthesiology. Dr. Cohen travels often to Africa, Central America, and other parts of the world to provide free surgical treatment to children born with facial deformities. He was involved in the 9/11 rescue efforts at Ground Zero in 2001 and worked in the Israeli Defense Force Field Medical Hospital in Haiti after the 2010 earthquake. He is the founder of Park Avenue Oral & Facial Surgery, P.C., Manhattan’s premier oral and maxillofacial surgery practice that made its grand opening in 2010. In 2016, Dr. Cohen founded Park Smiles NYC Pediatrics, a practice located in the Upper East Side that is dedicated to the care of pediatric patients, and patients with special needs. Our Park Avenue office is newly renovated with state of the art equipment and facilities, and an ambulatory surgery facility that is accredited by the American Association for Accreditation of Ambulatory Facilities, Inc. (AAAASF). This accreditation is your assurance of unparalleled safety in all aspects of outpatient anesthesia and surgery for you and your family.